Hello. 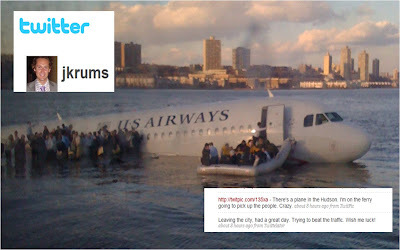 Tonight I just wanted to share some thoughts on how I "watched" the coverage of today's top story - the US Airways plane landing in the Hudson River - on both mainstream media and my Twitter network. I'm not sure if I'm a fan of the term "citizen journalist" but I couldn't help but be amazed as I saw stunning first photos of the rescue - see picture above taken by Janis Krums while on a ferry coming to help the passengers. He used TwitPic to post the picture immediately and it is now being viewed around the globe. I think this has some powerful implications for education and how our students obtain information. What do you think? Who controls the flow of information today? Is it as reliable as it was 15 years ago? Is it better or worse? Just some thoughts on a Thursday night before I head to bed.